January 29, 2016 – Foster Fuels responds to winter storm Jonas on January 22 through January 24, 2016. The winter storm brought more than two feet of snow from the Washington, D.C area to New York City. Heavy snow also impacted many parts of the Mid-Atlantic bringing more than a foot to over 14 states. As the region prepared for the storm, all five Foster Fuels locations were on high alert. All divisions from Wholesale to Hearth and Home were working overtime to service residential and commercial customers in Central Virginia. The Mission Critical Emergency Division was called into action to protect critical infrastructure. 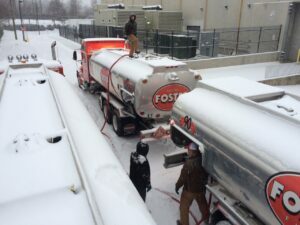 Foster Fuel’s heating oil and propane division worked long hours as extra trucks were provided to service Virginia residents before and after the storm. With fuel deliveries and residential maintenance in progress, customers all over Virginia were delighted to know Foster Fuels was doing their best to keep up with the increase in demand before the storm. Foster Fuels was on the move early and throughout the week assisting local and mission critical customers in nine states from North Carolina to New York with the specialized Emergency Response Team. Mission critical businesses scattered around the East Coast were able to operate thanks to this unique division of Foster Fuels. Foster Fuels is happy to serve all of our customers. Thank you for clearing your driveways and ordering early. We are truly thankful to call you family. I just checked my gauge on the tank @ 156 William Dr, and it is showing ’70’. Please note that our address is 156 William Dr, no ‘s’ on the name. Had a recent disagreement with USPS, they won! Thanks for your exceptional customer service. And tell Tim Milton to keep it between the lines!! Thank you for your comment Jim! We will notify our propane department to make sure there is no confusion. Have a great day! Mark D. Roberts, Sr. VP & COO of Sonny Merryman, Inc. While at work on Monday March 3rd I texted Watt shortly before 8:00 AM and requested a couple of hundred gallons of propane. I had let the tank run very low and was concerned that I would not have enough to make it through the day. If you remember, it started snowing Monday at about the same time (8:00 AM) raising my concerns regarding delivery in time to avoid running out. Not to worry. Before 8:30 AM, I received a text from my wife saying fuel delivered, check written, truck pulling out of the driveway. I really appreciated that as did my family. They all had a snow day; with heat.